1. Take advantage of on-campus resources. Your campus career center wants to help you get a job! Even if you've already graduated, you may have access to your college career center. 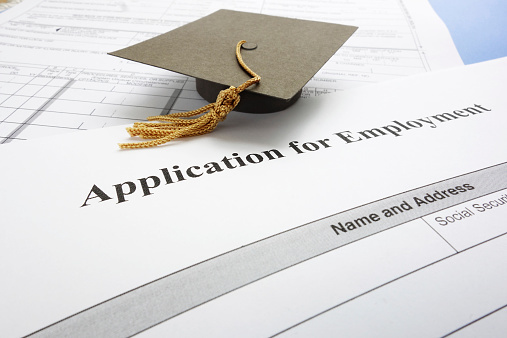 Besides being able to put you in touch with companies that are looking for graduates with your degree from your school, college career centers can help you buff up your resume and improve your interviewing skills. 2. Take advantage of other schools. Many college towns have more than one school, so take advantage of events at the other institutions. Even if you can't officially participate in a career fair if it's not your school, you can usually get a list of the participating employers. Reach out to them and see if you can schedule an off-campus meeting when they're in town. ​ An internship with a technology firm can help you get a job after graduate. 3. Do one or more internships. You can do internships during the summer when you're studying, as a co-op student for a semester while you're earning your degree, or as a way to get your foot in the door after graduation. Make sure your internship gives you a chance to make a real contribution and learn something from your job. Stay in touch with your supervisor and let them know when you're looking for a permanent position. Even if there isn't an opening in their department, they can talk you up and put you in touch with a colleague elsewhere in the company. 4. Join student groups. Taking an active role in a group stands out on your resume. It also helps you get more contacts, both with hiring firms and other students who can share leads. 5. Do a research project with a professor. Having a research project on your resume is another way to stand out. Besides the project, if a professor gets to know you well by supervising a project, they can give you a great recommendation that might help you get the job. 6. Take initiative. Lots of great jobs aren't advertised. If there's a company that you think would be a really cool place to work, reach out to them even if they aren't recruiting on your campus. Follow companies that interest you on Facebook and Twitter. You can even try tweeting them to get their attention. 7. Take advantage of people you know. Well, don't literally take advantage of them, but take advantage of the contacts they have. Personal recommendations carry a lot of weight with hiring managers, so it's a big plus if someone who already works at the company recommends you. 8. Follow up with everyone you contact. Keeping yourself visible is a big part of the job-hunting process. Whenever you meet with someone, follow up to thank them for their time. If someone says they'll be in touch, then isn't, don't assume it's a polite brush-off. It might be, but it's equally likely they've been busy. Remind them - nicely - and you may get a positive result. Starting your career is exciting. Join our talent network today and find the right first job for you.